Alabama has had an enviable success rate when it comes to tourist attractions, with some that date back to the 1930s still drawing crowds today. But many others have come and gone, sometimes leaving little evidence of their existence. Join Alabama native Tim Hollis as he revisits iconic attractions such as Canyon Land Park and Sequoyah Caverns, the floral clock at Birmingham’s Botanical Gardens and the traffic safety torch held aloft by Vulcan, the iron man. Many Gulf Coast attractions are gone, including Styx River Water World and Spooky Golf, but the memories remain. Author Tim Hollis has written thirty books on pop culture history, a number of them concerning southeastern tourism. 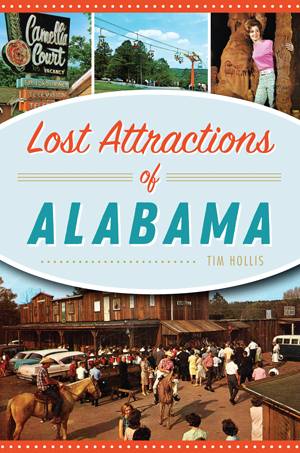 He has collected the best images from his personal archives as well as those across Alabama to showcase the various attractions featured in this volume.